Prophetically speaking the Bible has much to say about Israel and the Messiah of Israel, and to understand where we are on God’s Prophetic time table, we only have to look to Israel. It’s not always appreciated in our day, that Israel as a national entity didn’t exist for almost 1900 years (from 70 AD when the nation was dispersed by the Roman Empire until MAY 14, 1948). For the last 70 years, the Jewish people have been brought back into the land, established once again as a national entity, with their own government, their own economy, an updated form of Hebrew, their own social structure and military – one of the greatest in the world; their Air Force is second to none! Quite an accomplishment! Their historical heritage is restored and preserved. NEVER in all the history of humanity has this ever happened to a nation; Israel is the first and only people to have been dispersed and brought back and re-established after almost two millennia! And the Bible, the Word of God predicted that this would happen, not once, but twice – but not a third or fourth time! 11 And it shall come to pass in that day, that the Lord shall set his hand again the second time to recover the remnant of his people, [from all the world over], and from the islands [coast lands] of the sea. 12 . . . and gather together the dispersed of Judah from the four corners of the earth. Scripture indicates that once the church, the body of Christ is completed, when the LORD has finished “calling out a people for His name” and takes us Home, that the LORD will turn once again and re-establish the Kingdom of Israel (“the tabernacle of David”; see ACTS 15:14-16). The LORD has been at work, preparing Israel for the coming kingdom by assembling His people – who still don’t know Him, they don’t recognize Jesus as the Messiah (ROM 11:25), they are not yet born of His Spirit, but EZEK 37:14 tells us they will be, once they behold and receive their Messiah Who at that time will strike down and destroy her enemies that are determined to destroy Israel (ZECH 12:9-10; 13:6). But Israel has much to go through before the Blessed Day of their Messiah’s Coming, and we will look at what’s happening to them today, what is in their near future, and what prophecy tells us about these things. We’ve seen and read the news about recent events surrounding Israel’s enemies, especially Iran which has vowed to wipe Israel off the map, how they have established bases in Syria and are establishing more, preparing one stage at a time for a full attack against the Jews. We see in the picture above of: Vladimir Putin of Russia (upper left), Recep Erdoğa of Turkey (upper right) - Putin committed to building Turkey’s first nuclear power plant for the price of $20 billion (operational by 2020) as well as the Russian made S-400 Missile Defense System which is capable of destroying aerial targets from all ranges and has tracking technology for cruise and ballistic missiles and projectiles. Then of course we have Hassan Rouhani of Iran (lower left); these men have formed a triple axis of power, cementing an unlikely alliance over Syria in a challenge to US and western influence in the region. Russia's influence in the Middle East is increasing, while the United States own influence there is decreasing. And in addition to these nations establishing a presence in Syria, China has also gotten involved, offering indirect assistance to Syria in ‘stabilizing the region’: China is wholly dependent on Middle Eastern (and Canadian) oil for its industrial needs! No one would view a single 'spark' as any threat, right? And these recent events in and of themselves, from a global perspective don’t appear to be that much of a threat. But what about a spark in a room full of dynamite? One spark could ignite one powder keg, set off a chain reaction and bring total destruction. And that’s exactly what we have here: a geo-political, military-infused powder keg, that only needs a spark to set off the major global event WW 3 in the Middle East! “The recent missile strike on a military airbase deep in the central Syrian desert looks like the latest installment in a long-standing Israeli campaign to police its [borders] against highly dangerous developments to its north. "Usually, such strikes are driven by incoming intelligence of threatening activity underway in Syria--activity that breaches Jerusalem's ban on Iran from constructing military bases in Syria, from setting up weapons factories there and from using Syria as a transit zone for the trafficking of advanced arms to Hezbollah in Lebanon. "[They are] . . . attempting to expand the Iranian military presence on Syrian soil. Israel is determined to stop this at all costs. "By chance or not, the strike also comes amid fallout from the Syrian government's use of chemical weapons against rebel-held areas (Sunni Muslim) over the weekend, leading to warnings from President Donald Trump of likely military strikes in retaliation (which are scheduled to take place any day now). ". . . over the past several years, Israel has reportedly carried out a series of strikes targeting the Iranian-led (Shi’ite Muslim nation) axis in Syria. If left unchecked, Iran would flood Syria with Shi'a militia groups and terrorist organizations, arm them with rockets and missiles, and set up terrorist cells. 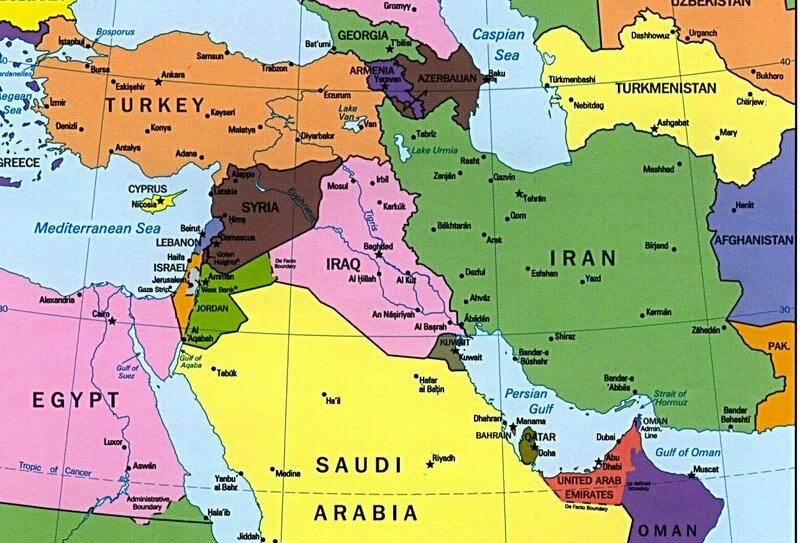 It would convert southern Syria into a new launch pad for attacks against Israel. "Iran's Quds Force, the elite overseas unit, and Hezbollah use Syria to manufacture and smuggle precision-guided ballistic missiles, heavy rockets, advanced surface-to-air missiles and surface-to-sea missiles. Israel has reportedly disrupted these activities on a regular basis. "Lebanon is already a well-established Iranian rocket base, filled to the brim with 120,000 rockets embedded in 200 Shi'a Lebanese villages. All of these projectiles are pointed at Israel. Under Iran's plans, Syria, too, would become a major threat." Note the distance between Israel and Iran – just over 1400 miles, roughly the distance between Los Angeles, CA and San Antonio, TX. Imagine having enemies who have sworn to destroy you living in such proximity, and with long range missiles quite capable of striking your homeland (however easy targets for Israel over such a distance. So Iran needs to get closer – Syria)! "The southern region of Syria is reasonably well dominated by Iran, as is Lebanon – both of which as you can see, are snuggled against Israel’s northern border. Further north, you have Turkey who has made aggressive overtures in their alliance with both Russia and Iran! "Iranian military personnel were killed in a recent Israeli strike; whatever was going on at the T4 airbase [in Syria]--hundreds of kilometers from the Israeli border--constituted a serious security threat to Israel, and that Iran has again tested the waters, seeing how far it can go in building up its military presence before provoking an Israeli response. "Russia acts as the air force of the Shi'a axis in Syria. Russian airpower helped turn the tide of the war in [Syrian leader] Assad's favor, a fact that has probably given the Syrian dictator the confidence to unleash the horrors of chemical warfare on Sunni areas [enemies in his own country] . . .
"Russia has, through its waves of airstrikes in Syria, gained a port at Syria's Tartus naval base, and it has an airbase at Hmeimim on the Syrian coastline. It has moved advanced air-defense batteries to Syria. 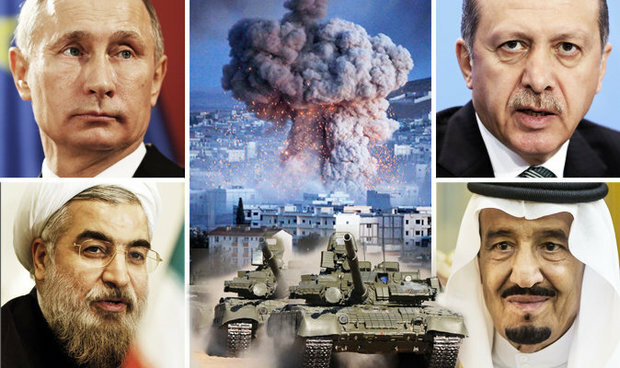 Moscow has used its intervention to position itself as a superpower in the Middle East. Meanwhile, the United States has decreased its influence in Syria to a bare minimum. "Israel seeks no conflict with Russia but is unwilling to ignore the activities of Moscow's allies--something Israel has communicated to Russia repeatedly. "The Russians have so far been able to help de-escalate the situation by convincing their radical allies to tone down their responses to Israel's self-defense actions. The Iranian axis may not have needed much convincing; it remains fundamentally deterred by Israel's vast firepower and intelligence capabilities. "Iran is keen on consolidating its control of Syria at this stage, rather than opening a new active front against Israel right now, which would risk its entire Syrian project. But if it succeeds in its goal of converting Syria into a new base of hostility towards Israel, there can be no doubt that sooner or later, it [will] activate this front [and Iran will be confident in a full-scale war against Israel]. Statements released by Moscow on Monday indicate Russian displeasure at Israel's alleged actions. Yet Israel has responded that it will not blink when it comes to defending its security. Whatever triggered the strike, one thing seems certain: Iran will continue to test Israel's lines, and Israel will continue to enforce them.” ~ end of article by Prophecy News Watch. So, the threat is real – and it seems to be consolidated in the lower half Syria where Iran is building its bases and arming terrorists groups that want the blood of Israel on their own hands. What will Israel be forced to do eventually? It’s too small a nation to allow the enemy a first strike. If the United States were to get struck with a nuclear weapon or a series of other types of powerful weapons instead, tragic as that would be, we are large enough in size to sustain such a hit. If Israel were to get hit with exactly those same kind of weapons, it would take them out. The burden of Damascus. Behold, Damascus is taken away from being a city, and it shall be a ruinous heap. 2 The cities of Aroer are forsaken: they shall be for flocks, which shall lie down, and none shall make them afraid. 3 The fortress also shall cease from Ephraim, and the kingdom from Damascus, and the remnant of Syria: they shall be as the glory of the children of Israel, saith the Lord of hosts. 4 And in that day it shall come to pass, that the glory of Jacob shall be made thin, and the fatness of his flesh shall wax lean (see also PSALM 83). "taken away from being a city"? "it shall be a ruinous heap"? This has never happened in all of history, and Damascus has a lot of history! It's one of the oldest cities in the world, with it’s founding, many believe dating back to the 3rd millennium B.C.! Think about that! That’s more than thirteen times the entire history of the United States of America, starting way back with the Pilgrims at Plymouth Rock! This is a city that has endured, that has never waned in its population, a civilization that was never interrupted by fatal tragedy that required her people to restore their domain. And yet prophecy indicates that “it [shall be] taken away from being a city” and become “a ruinous heap”, “forsaken” and its defenses (“fortress”) shall cease – the kingdom of Damascus and the remnant of Syria. And the word of the Lord came unto me, saying, 2 Son of man, set thy face against Gog, the land of Magog, the chief prince of Meshech and Tubal, and prophesy against him, 3 And say, Thus saith the Lord God; Behold, I am against thee, O Gog, the chief prince of Meshech and Tubal: 4 And I will turn thee back, and put hooks into thy jaws, and I will bring thee forth, and all thine army, horses and horsemen, all of them clothed with all sorts of armour, even a great company with bucklers and shields, all of them handling swords: 5 Persia, Ethiopia, and Libya with them; all of them with shield and helmet: 6 Gomer, and all his bands; the house of Togarmah of the north quarters, and all his bands: and many people with thee. “Gog and Magog” - "the nation from the north (of Israel) / barbarous region of the north". The Great Wall of China lies on the far eastern border of Russia, and the ancient name for this immense structure, that can be seen from orbit, is translated “the ramparts of Magog”. The Jewish historian Josephus has identified the land of Magog as Scythia, the progenitors of Russia which is north of Israel. Also, in the table of nations, GEN 10, Magog is identified as one of the sons of Japheth. Therefore, by the time of Ezekiel and in the future his offspring would be a major nation. The leader, Gog from Magog leads this alliance of nations against Israel. “chief” prince – rosh: the head, captain, intent to initiate war; tribal leader; the first in order – Scythians were Eurasian nomadic barbarians. Chief Prince of Meshech and Tubal. * rosh – or Nomadic tribe of Rus - “Russia”? Prince of Rosh: The identification of this title for Gog is not accepted by all. The Hebrew word for chief is Xar Ro'sh, which can be translated either as a name, Rosh, or as the adjective 'chief'. Some translations will translate this as "chief prince" instead of "Prince of Rosh" based upon their views. Regardless, Gog is identified as a leader from the far-north who is head of the descendants of Meshech and Tubal (these two cities in the region of modern-day Turkey) in the land of Magog. “Meshech and Tubal”: like Gog and Magog, sons of Japeth, son of Noah – father of the Caucasian peoples. Today they represent the Western half of Turkey: – A Russian leader controlling these regions in Western and Central Turkey? Isn’t this what we are seeing developing with Vladimir Putin? Gog is the leader of this alliance. In Ezekiel’s day these nations were listed as traders of people and brass vessels or utensils for the goods of Tyre (See GEN 10:1-2; EZEK 27:13). “hooks into your jaws”: I will turn you: God is pulling this alliance toward Israel; God Himself is involved in this upcoming battle. Gog is pictured as an animal with hooks in its jaws being pulled into the conflict; God places the hooks in the jaws of Gog. A common practice of the Scythians to pierce their defeated enemies with hooks through their jaws (or noses) and drink their blood from their own skulls! “Persia”: The nation of Iran without any dispute. Since it is mentioned first, the biblical significance is that it takes a leading role. “Ethiopia, Libya”: These are nations that are with us today, with the same names. “house of Togarmah”: Eastern half of Turkey, together with Meschech and Tubal, these represents the whole nation of Turkey. 7 Be thou prepared, and prepare for thyself, thou, and all thy company that are assembled unto thee, and be thou a guard unto them. 8 After many days thou shalt be visited: in the latter years thou shalt come into the land that is brought back from the sword, and is gathered out of many people, against the mountains of Israel, which have been always waste: but it is brought forth out of the nations, and they shall dwell safely all of them. 9 Thou shalt ascend and come like a storm, thou shalt be like a cloud to cover the land, thou, and all thy bands, and many people with thee. 10 Thus saith the Lord God; It shall also come to pass, that at the same time shall things come into thy mind, and thou shalt think an evil thought: 11 And thou shalt say, I will go up to the land of unwalled villages; I will go to them that are at rest, that dwell safely, all of them dwelling without walls, and having neither bars nor gates, 12 To take a spoil, and to take a prey; to turn thine hand upon the desolate places that are now inhabited, and upon the people that are gathered out of the nations, which have gotten cattle and goods, that dwell in the midst of the land. “The land that is brought back from the sword” – ‘sword’ representing military violence. Israel endured the Holocaust and Nazi atrocities; afterwards they were brought back into the land on May 14th, 1948. “A [land] that has been always waste” – Until the land was reclaimed by Israel it was a desert wasteland, barren of water except for malaria-infested swamps. Today they export fruit and vegetables that feeds Europe. “brought forth out of the nations” – history shows that the Jews came from all over the world – Europe and Middle East mostly, to Israel. 13 Sheba, and Dedan, and the merchants of Tarshish, with all the young lions thereof, shall say unto thee, Art thou come to take a spoil? hast thou gathered thy company to take a prey? to carry away silver and gold, to take away cattle and goods, to take a great spoil? 14 Therefore, son of man, prophesy and say unto Gog, Thus saith the Lord God; In that day when my people of Israel dwelleth safely, shalt thou not know it? 15 And thou shalt come from thy place out of the north parts, thou, and many people with thee, all of them riding upon horses, a great company, and a mighty army: 16 And thou shalt come up against my people of Israel, as a cloud to cover the land; it shall be in the latter days, and I will bring thee against my land, that the heathen may know me, when I shall be sanctified in thee, O Gog, before their eyes. 17 Thus saith the Lord God; Art thou he of whom I have spoken in old time by my servants the prophets of Israel, which prophesied in those days many years that I would bring thee against them? 18 And it shall come to pass at the same time when Gog shall come against the land of Israel, saith the Lord God, that my fury shall come up in my face. “Sheba and Dedan” – Saudi Arabia - present day ally to Israel?? “Tarshish and the young lions” – England, and her former colonies: The United States. Note that no significant action is taken. They protest indeed, but they don’t come to the defense of Israel or launch counter-measures against this aggression. It was the same in Nazi Germany – nations turned their backs on the Jews who were eventually sent to the gas chambers . . . 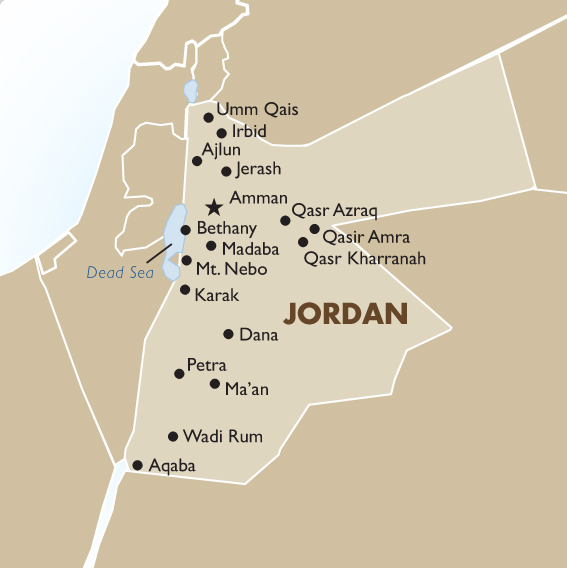 In vs. 15 – Again, “the north parts” is mentioned (“of the north quarters” vs. 6). It’s interesting that if you look at a globe and locate Israel, then proceed due north, you will eventually come across Moscow. Latter days” in vs. 16 repeats what was said in vs. 8 “latter years” Note: NONE of these prophecies would even be valid if Israel was not brought back into the land! ISAIAH 11:11 is the cornerstone of last days prophecy! 8 In that day shall the Lord defend the inhabitants of Jerusalem; and he that is feeble among them at that day shall be as David; and the house of David shall be as God, as the angel of the Lord before them. 9 And it shall come to pass in that day, that I will seek to destroy all the nations that come against Jerusalem. Israel faced impossible odds before: in their War of Independence, the world believed that the Arabs backed with state of the art Soviet military hardware and weapons would pulverize the Jews at the hands of seven different Islamic nations! Egypt, Iraq, Transjordan, Syria, Lebanon, Saudi Arabia, Yemen Holy War Army ALA! Again, in the Six Day War, similarly armed the Arabs fought against the Jews and in a marvel of military ingenuity if not by the outright miraculously intervening hand of God, Israel gained the victory over several Muslim armies!! Yet no one attributed these victories to God Himself . . . But in this war described in EZEKIEL 38; 39, not only the Jewish people, but “many nations” will know that this was an act of God in decimating – “leave but a sixth part” of Israel’s enemies! See EZEK 38:18-22; 39:1-2. 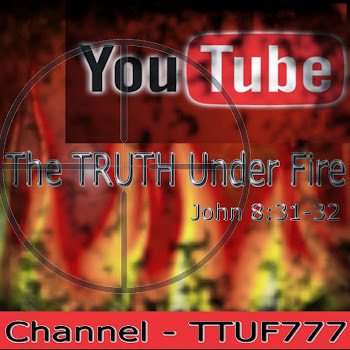 Could this perhaps prepare the remnant of Israel (ZECH 13:9) and of the Gentile nations to receive Christ during the Great Tribulation (REV 7:14), oppose the Beast, and become (in the case of the Gentiles) martyrs who refuse the mark of the Beast? 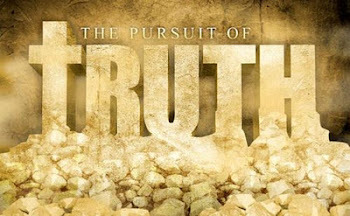 We know that Satan’s primary objective is to destroy Israel; because if he destroys Israel, then the prophecies regarding the kingdom of Israel and the reign of the Messiah will never come to pass, the prophecies of the Word of God would be broken, God seen as a liar and therefore unable to judge him and his followers. He will however, fail to destroy Israel using Gog, Magog and her allies. He will soon attempt to destroy Israel with the Beast and the armies of the world, heading to Jerusalem by way of the Valley of Megiddo – where the LORD Jesus Christ will meet with them and obliterate the armies at the Battle of Armageddon (REV 16:12-16)! REV 19:11-16 depicts Christ on a white horse, leading the armies of heaven and by Himself bringing the wrath and judgment of God upon those who have rejected Him. ISAIAH 63:1-6 tells us of His defense of His people who are hiding from the Beast who is intent on seeking them out and killing them (REV 12:16). 1 Who is this that cometh from Edom, with dyed garments from Bozrah? this that is glorious in his apparel, travelling in the greatness of his strength? I that speak in righteousness, mighty to save. 2 Wherefore art thou red in thine apparel, and thy garments like him that treadeth in the winefat? 3 I have trodden the winepress alone; and of the people there was none with me: for I will tread them in mine anger, and trample them in my fury; and their blood shall be sprinkled upon my garments, and I will stain all my raiment. 4 For the day of vengeance is in mine heart, and the year of my redeemed is come. 5 And I looked, and there was none to help; and I wondered that there was none to uphold: therefore mine own arm brought salvation unto me; and my fury, it upheld me. 6 And I will tread down the people in mine anger, and make them drunk in my fury, and I will bring down their strength to the earth. The LORD will protect His people, the remnant of Israel that will come to faith during the Great Tribulation, those who will be taking refuge in Edom (Jordan), in Bozrah, or as it’s also known as, Petra. MICAH 2:12 12 I will surely assemble, O Jacob, all of thee; I will surely gather the remnant of Israel; I will put them together as the sheep of Bozrah, as the flock in the midst of their fold: they shall make great noise by reason of the multitude of men. When once the Beast is defeated, and the Judgment of God is fully poured out upon a Christ-rejecting world, what can Israel and the church look forward to? The MILLENNIAL REIGN of JESUS CHRIST! !